When the route of the new Quiznos Pro Challenge was announced in Denver this past November, American Football Player Shannon Sharpe (an ex Bronco and cyclist) showed up to give his support. Here Sharpe has some fun with local cyclist Tom Danielson (who holds the record for fastest accent up Mount Evans). 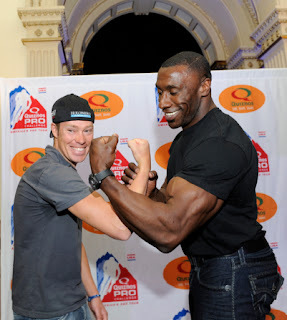 Shannon Sharpe's bicep is about he same size as Danielson's head.